After yesterday’s torrential rain, it was an overcast morning with a strong gusty wind, but it brightened up later. 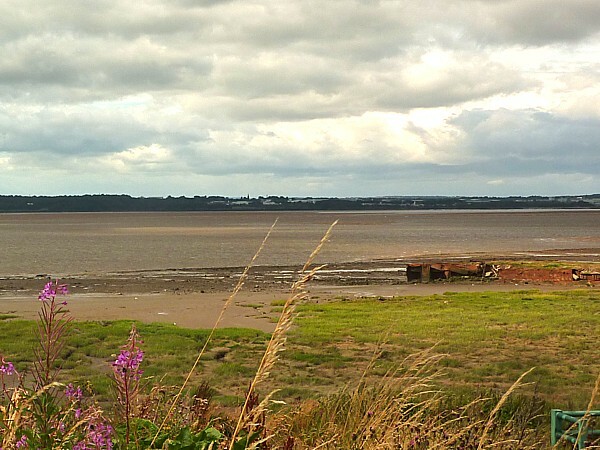 We took the path along the Speke-Garston Coastal Reserve, during a very low tide – the river looked as if it was all sandbanks. 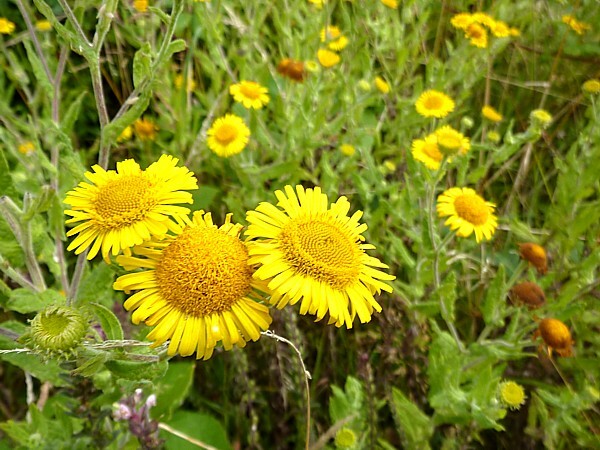 Many of the wildflowers had gone over but there was still Ragwort, Yarrow, Mugwort, Rose Bay Willowherb, Knapweed, Sea Bindweed, Fleabane, Wild Carrot, Perennial Sow Thistle with the raggedy petals, Scarlet Pimpernel, and one with yellow flower spikes that still confuses us. 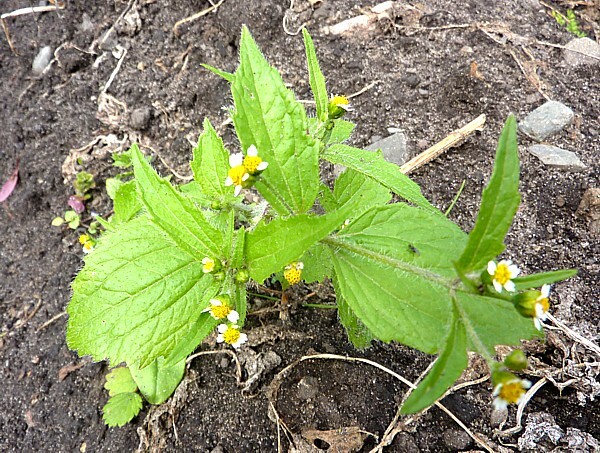 Not Weld, not Mignonette, but since it’s a legume it must be one of the Melilots. 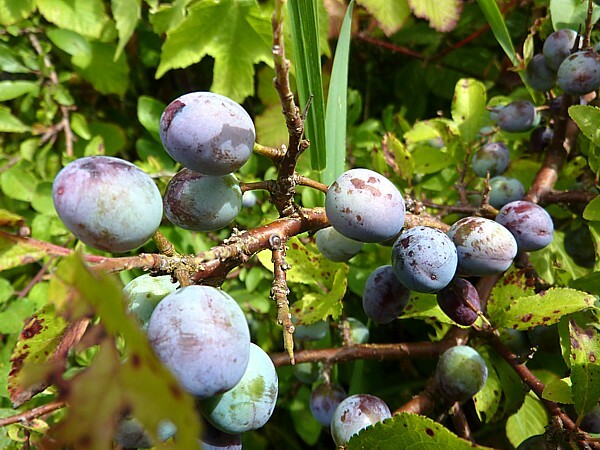 The sloes were ripening on the Blackthorn, and the Blackberries were doing well. Birds included Black-headed Gulls, a lone Curlew on the beach, a Goldfinch near the sailing club slipway, Cormorants flying past and Swifts overhead. 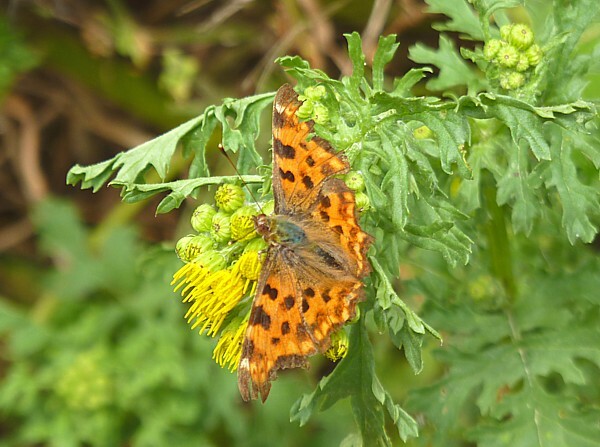 When the sun came out no less than three Gatekeepers came out to bask, there was a large White on some Ragwort and one Comma. 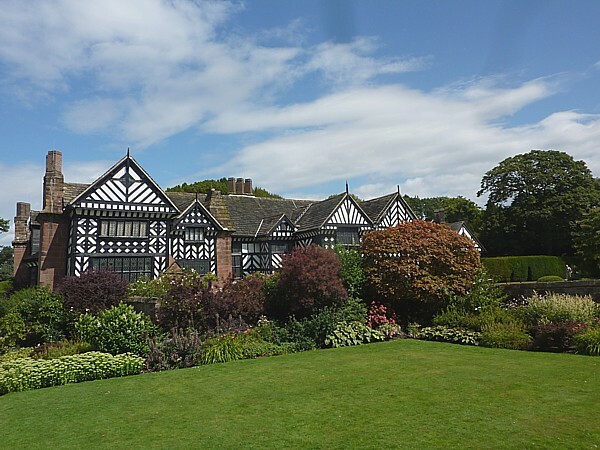 We got into Speke Hall grounds by the back entrance and had lunch on their picnic tables. 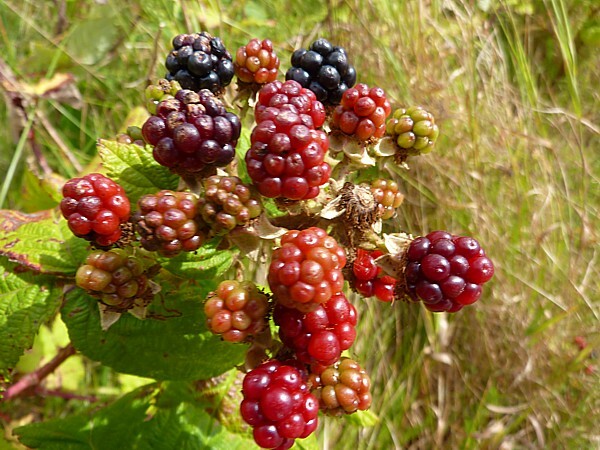 There were Swallows overhead, a Robin on the edge of the lawn and Magpies and Wood Pigeons in the trees. 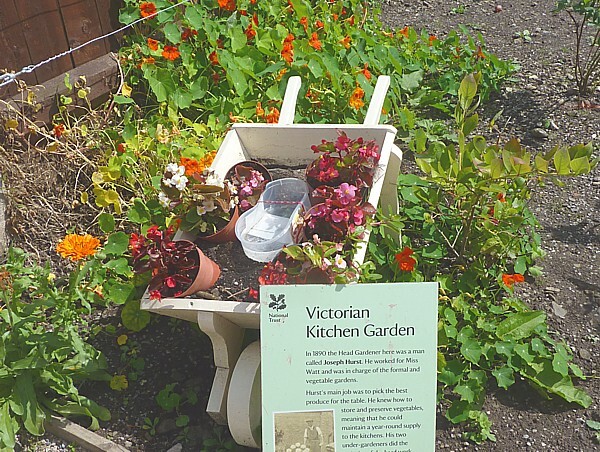 Then we strolled around the recently-restored Kitchen Garden. 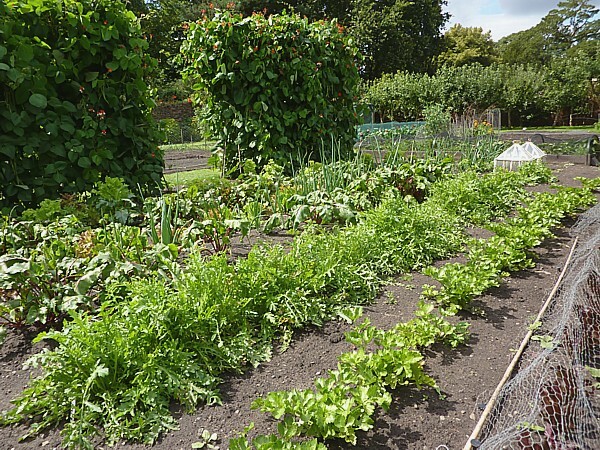 They are aiming for a combination of organic methods and Victorian varieties. 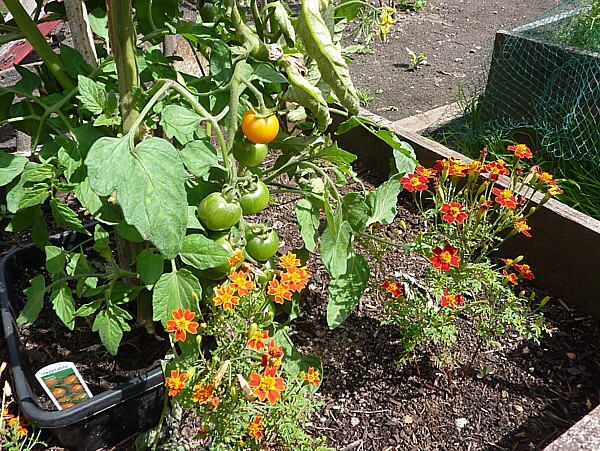 They had planted Marigolds next to the Tomatoes, which are said to keep the whitefly away. 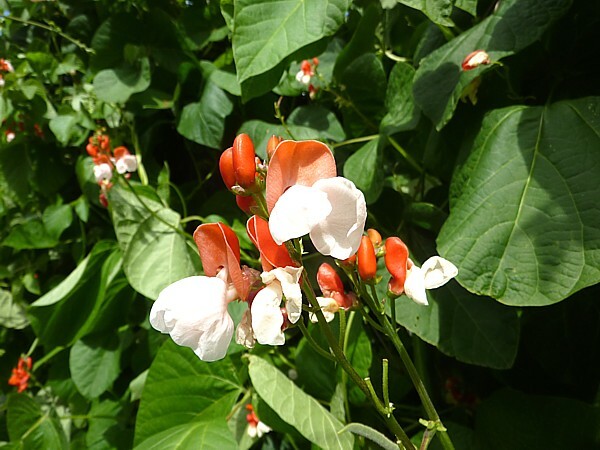 Their runner beans were an old variety called Painted Lady. 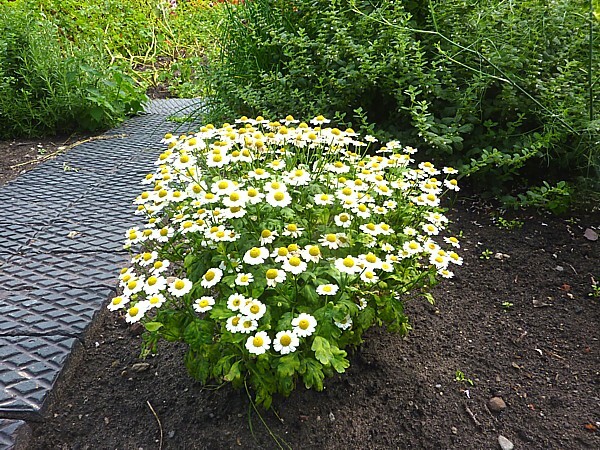 They have active beehives, five or six apple trees, ripening figs and a herb garden which included this fine clump of Feverfew. They have a woodland trail, where there were masses of Bluebell stalks – it will be magnificent here in April or early May. 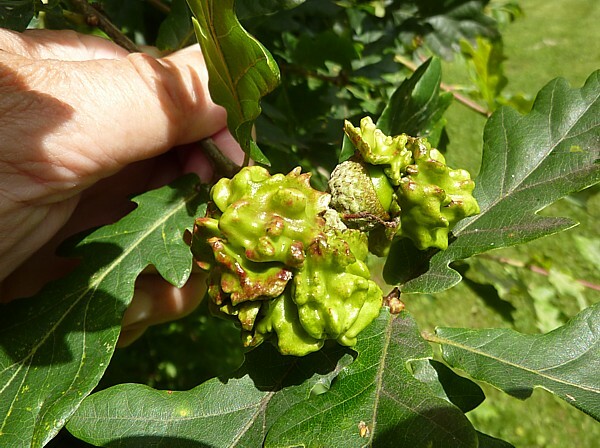 One of the Oak trees had a crop of knopper galls on the developing acorns. 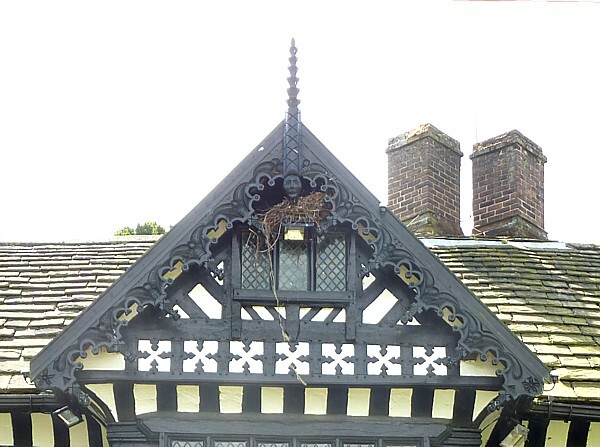 On the front of the Hall, under the points of the eaves there are old carved wooden faces, and Crows or Jackdaws have been nesting under some of them. Near the way out there was the stump of a huge old tree. 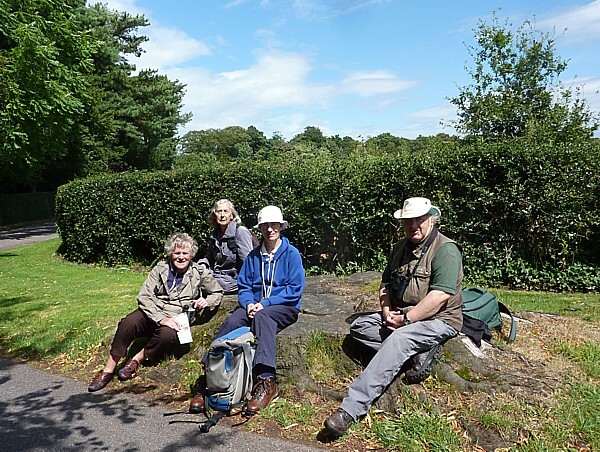 In the picture below all four people are sitting on the same stump, with room for more. Had it been a Beech? On the pond were two Mallards and a Moorhen. On the far side a pair of dragonflies were chasing each other. One was noticeably blue and the other brown. They didn’t come close enough to identify with certainty, but they were big, so we guessed they were Emperors. Fish were jumping, and a young man was angling for them, throwing small handfuls of tinned sweetcorn as bait. He said he’d only caught two, and they were small Rudd about 6″ long. There were lots of Molehills beside the driveway on the way out. Public transport details: 80A bus from Liverpool ONE bus station at 10.10 to Blackburne Street / Banks Road, arriving 10.45. Returned on the 86A bus from Speke Hall Avenue / Speke Hall at 2.40, arriving Liverpol 3.10.